This automatic welding machine is equipped with a robot. It realizes accurate control of heating time, welding filler feeding amount and time, and effective control of air flow. This leads to good control of welding temperature, and the formation of filler molten pool. The welding products are of good quality and stability. The robot enables welding from any angle. It can be utilized in welding, soldering, or brazing various kinds of products. We can customize the machine to meet your specific requirements. Welding product: even filler flow, well filled molten pool, no dry joint. Fully automatic robot can perform welding from any angle. Quick loading and unloading of the workpiece. 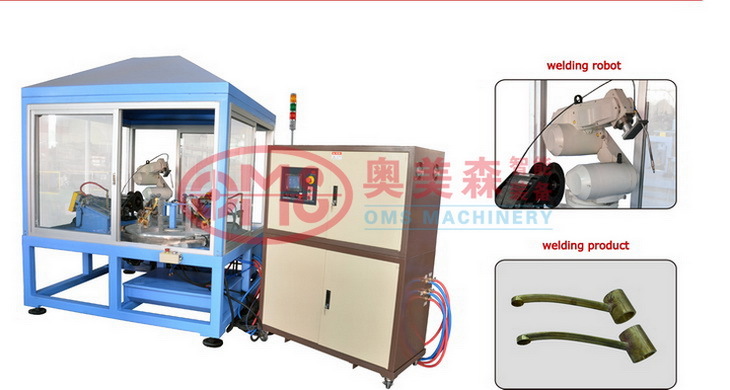 Automatic welding wire feeding device, which can accurately control the filler amount and feeding time. Pneumatic welding gun, which reaches to the welding point quickly. Fully automatic control of gas flow amount, which controls the flame. Strong flame and weak flame can be switched automatically. When the welding gun is waiting for the next work piece, the weak flame mode will be turned on automatically. Nitrogen is used to extinguish the flame (to avoid backfire). Automatic device for feeding welding paste, which enhances the welding results. The technical parameters can be adjusted. For example, the movement cycle time and speed of the fixture, the distance between the nozzle and workpiece, the feeding speed, timing, and height of welding filler, the distance between the welding filler and workpiece, the flow of fuel gas and nitrogen, etc. The technical parameters can be stored and accessed. Strick leak detection is carried out before delivery. The fuel gas channel and oxygen channel are installed with anti-backfire valves.